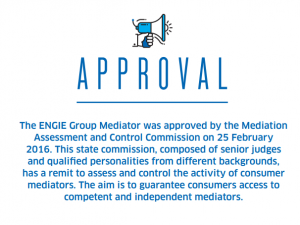 The ENGIE Mediation function is an independent entity, registered on the list of consumption mediators. The Mediator has been notified to the European Commission. ENGIE Group’s Mediation does not depend on any operational or commercial structure within the Group. ENGIE Group’s Mediation acts independently and impartially with respect to the parties involved in the disputes it handles. The Mediator has no subordination relationship within ENGIE. without any subordination with the company. ENGIE Group’s Mediation also respects the Mediation Charter of the Club des Médiateurs de Services au Public (Club of Public Service Mediators). The Mediator, Jean-Pierre HERVE, has been accredited as a Consumption Mediator by the CECM (Commission for Evaluation and Control of Mediation) and is registered on the European list of consumption mediators. His professional background means he has extensive experience of the energy business and stakeholder relations. To maintain his skills at the highest level, he regularly follows training on mediation, consumer law and consumer expectations, etc. What is the scope of the Mediator’s remit? The customers concerned may be individuals, companies, local authorities, institutions, public departments, landlords, co-owner associations, etc.